Originally Submitted to FurAffinity.net on Aug 8th, 2008 02:37 PM. This piece will become a 5-foot standee at Eurofurence 2008, and it was an incredibly fun project to do! Never before had I worked at such a big project (literally - it was 300dpi, nearly 5ft by 3ft, or 1.6m by 1m for those who do that thing), and it was a ton of fun to really really concentrate on all the fine details (which probably won't end up printing through at 300dpi, but ah well). 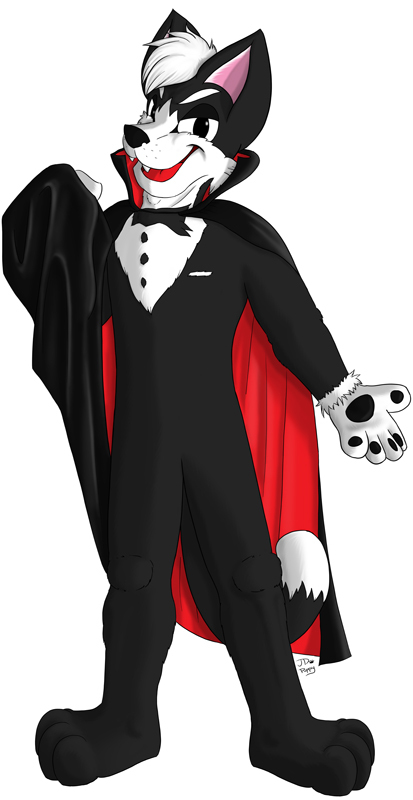 The art features Tux, the tuxedo cat, whom I had debuted at FC07 for the 007 theme -http://www.flickr.com/photos/21141386@N00/374848786/ - this time donning a vampire cape and greeting his unsuspecting victims into the doom of the horror-themed EF this year! For those attending the con in Germany, you'll see the bouncy puppy as well as this sneaky, subdued feline romping about the convention grounds! Character & Artwork © myself.